Apple Music is one of the most popular streaming music service and now available on Windows, Mac, iPhone, iPad, Android phones & tablets, Apple TV, etc. However, if you would like to enjoy your favorite Apple Music songs on iPod Nano, iPod Shuffle, Sony Walkman or MP3 player, Apple Music Converter is required. Here we will review Apple Music Converters from TuneMobie, Sidify and Tuneskit. All of them can convert Apple Music songs to MP3 or M4A well, but our conclusion is TuneMobie Apple Music Converter is the best one and you can download it below to have a quick try. Part 1: Why Do We Need Apple Music Converter? Part 5: Which Apple Music Converter We Should Choose & How to Use? Why Do We Need Apple Music Converter? Apple Music Converter may not be a must-have program, but you may have various reasons to get an Apple Music Converter. Apple Music is available on Windows 7 or later, Mac 10.9.5 or later, iOS 8.4 or later, Android 4.4 or later and Apple TV 4th generation. It has covered a wide range of devices people use frequently in daily life. However, Apple Music songs can't be played on many popular portable media players and game consoles like iPod Nano, iPod Shuffle, iPod Classic, iPod Touch 4, Kindle Fire tablets, Sony Walkman, PSP, PS3, PS4, Xbox and various MP3 players, because all downloaded Apple Music songs are DRM-protected M4P files associated with Apple ID. Besides, Apple Music songs can't be used as background music in all kinds of video editing programs and DVD/Blu-ray creators. Even you are using iMovie, Final Cut Xpress, Final Cut Pro or other Apple-made programs, you can't import Apple Music into them. 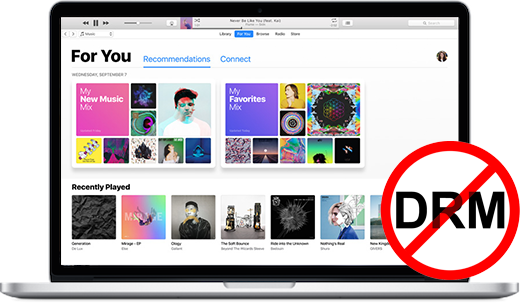 What is worse, if you unsubscribe the service, all your downloaded Apple Music tracks and playlists will disappear from your iTunes library. No matter what kind of reason a subscriber has, Apple Music Converter can bring lots of convenience to any Apple Music subscribers. There are several software programs called Apple Music Converter, and here we will review the most popular ones. Please note that there are some limitations in common of all Apple Music Converters. TuneMobie Apple Music Converter comes with an easy-to-use interface, diverse input and output support and different pratical features that other Apple Music Converters are lack of. TuneMobie Apple Music Converter can convert Apple Music, audiobooks and various iTunes supported audios, extract audio from iTunes supported videos. 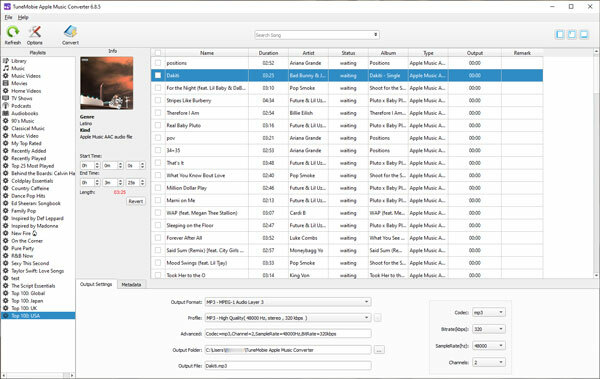 Besides, TuneMobie Apple Music Converter not only presever all ID3 tags, but also allows you to edit music information and rename the output songs in batch with ID3 tags. What is more, TuneMobie Apple Music Converter supports up to 16X faster conversion speed. Convert Apple Music, purchased M4A songs, audible AA/AAX audiobooks, iTunes M4B audiobooks, unprotected M4B audiobooks, other iTunes compatible audio formats like MP3, M4A, WAV, AIFF, etc. TuneMobie Apple Music Converter is an all-in-one audio converter, it possibly meets all your needs of converting music sources from Apple. There are No Cons we can find obviously. Sidify Apple Music Converter is also an easy-to-use Apple Music Converter. It can convert Apple Music songs, Audible AA/AAX audiobooks and iTunes M4B audiobooks to MP3, M4A, FLAC or WAV format. All the output files will also keep ID3 tags like song title, album, artist, track number, artwork, etc. 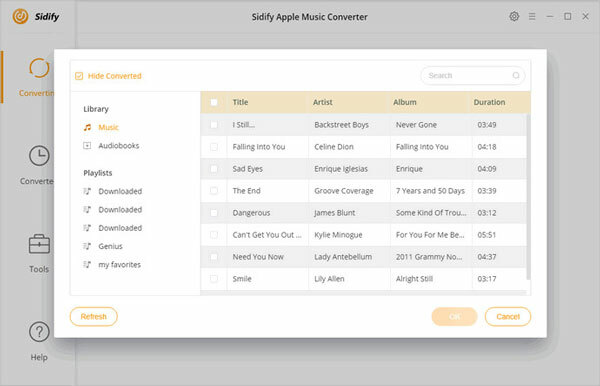 Sidify Apple Music Converter allows you to organize the output files by artist or album. As to conversion speed, Sidify Apple Music Converter claims 10X faster on Windows and 20X faster on Mac OS X.
Sidify Apple Music Converter can convert Apple Music songs and audiobooks without problem, but the cons above prove that it's not a good choice when you need to extract audio from iTunes videos or you want to keep audiobook chapters. And 1-year license is not available, you have to pay more when you want to cancel Apple Music in 1 year. 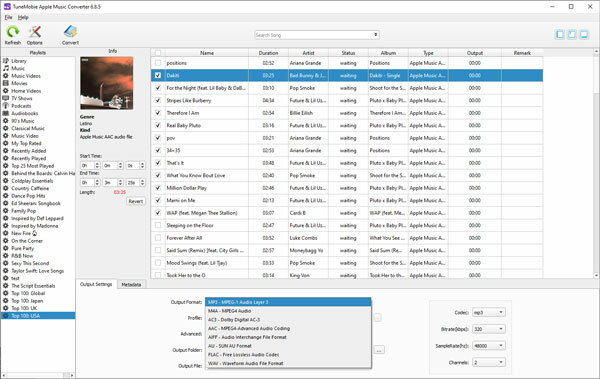 Tuneskit DRM Audio Converter can convert Apple Music songs, Audible AA/AAX audiobooks and iTunes M4B audiobooks to MP3, M4A, AAC, FLAC, WAV and M4B with ID3 tags preserved. 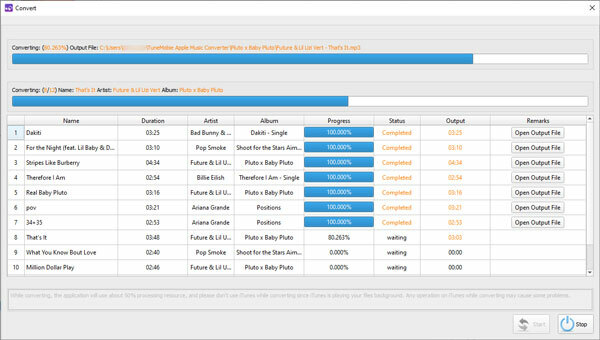 Besides, Tuneskit DRM Audio Converter can also convert various DRM-free audio formats like APE, FLAC, OGG, WMA, WAV, MP3, M4A, etc. Tuneskit DRM Audio Converter claims the conversion speed is 30X faster on both Windows and Mac OS X. Though Tuneskit DRM Audio Converter can convert various DRM-free audio files, but this can be done by all kinds of free audio converters. This doesn't make Tuneskit DRM Audio Converter better than TuneMobie or Sidify. The slow conversion speed and no feature of file organization are fatal problems. Which Apple Music Converter We Should Choose & How to Use? It's no doubt TuneMobie Apple Music Converter is the best Apple Music Converter among the compared ones. Actually, there are still some other software programs which can convert Apple Music to MP3, M4A as well, however, they are re-branded products of Sidify Apple Music Converter or Tuneskit DRM Audio Converter, and the features are the same and nothing new. Now let's learn how to use TuneMobie Apple Music Converter. Step 1: Launch TuneMobie Apple Music Converter and iTunes will be automatically launched as well. Apple Music songs, audiobooks, movies, TV shows, music videos and all playlists in iTunes will be displayed in the left panel. Step 2: Choose the Apple Music songs or other supported media files. You can choose an entire playlist by ticking the top checkbox or search the songs with built-in search box. Step 3: Choose output file format, audio quality and output folder. Customize the output parameters if necessary. You can click Options button to adjust conversion speed and specify a rule with ID3 tags for renaming and sorting output files. Step 4: Click Convert button to start conversion. You can click "Open output file" button to open output folder. Now, you can get Apple Music songs in MP3/M4A format. You can add the songs to iTunes library and sync to iPod Nano/Shuffle/Classic, iPhone or iPad, or copy them to Android phones & tablets, sony walkman, PSP, various MP3 players, USB drivers or SD cards. You can now also use your favorite Apple Music song as background music in iMovie, Final Cut and any other video editing programs and DVD/Blu-ray creators. The free trial version of TuneMobie Apple Music Converter can convert 3-minute of each song. Do not hesitate to download and have a try!